Lot 25 “Im A Bama Gangster” consigned by Toby and Amy Vineyard of Arvada, Wyoming and purchased by Gary Funk of Frazer, Montana for $25,000. 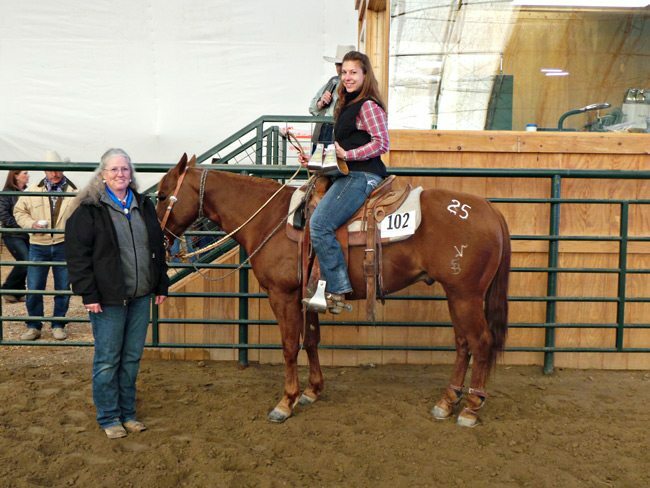 The ninth annual “REAL” Ranch Horse Invitational Sale was held April 18th at the Yellowstone Boys and Girls Ranch, west of Billings, Montana. 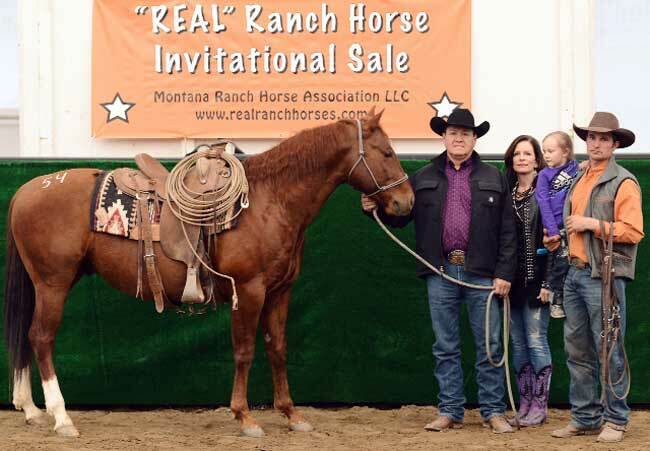 The sure enough ranch horses brought and previewed fresh by the people who make their living on them, drew a large and enthusiastic crowd, and produced an ever increasing sale average. The top five ranch horses sold averaged $21,800; top ten $18,425; top twenty $14,387 and all ranch horses sold averaged $9,455. There were two high selling horses. First, was Lot 25 “Im A Bama Gangster” a 6-year-old AQHA sorrel gelding consigned by Toby and Amy Vineyard of Arvada, Wyoming and purchased by Gary Funk of Frazer, Montana for $25,000. #2) caption: Lot 45 ” Cats Black Coyote” consigned by Roen Ranch of Musselshell, Montana sold for $25,000, and went to a ranch at Dillon, Montana. The other high seller was Lot 45 “Cats Black Coyote” an 11-year-old AQHA black gelding consigned by Roen Ranch of Musselshell, Montana. He also heard the hammer fall at $25,000 and went to a ranch at Dillon, Montana. Third high selling was Lot 27 “Cellphone” an 11-year-old grade black Quarter Horse/Draft gelding consigned by Jason Ward of Dillon, Montana. He left the ring at $21,000 and went to southern Wyoming. Fourth high selling (tie) was Lot 51 “Severes Flounder” a 9 year-old AQHA bay gelding consigned by Lazy J 3 QH’s of Melstone, Montana and purchased by Matt Brown of Lodge Grass, Montana for $19,000. Fourth high selling (tie) was Lot 56 “Cheyenne Point” a 6 year-old APHA bay tobiano gelding consigned by John Wollenburg of Red Lodge, Montana and purchased by Joe Poteat of Livingston, Montana for $19,000. 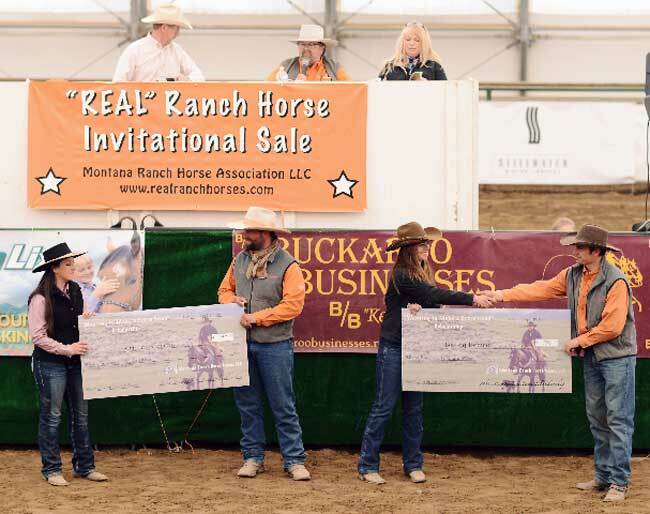 Nine head of young ranch horses (less experienced) also sold, with the top five averaging $6,800 and all of them averaging $5,628. High selling (tie) young horse was Lot 18 “Smiths Blue Hancock” a 5 year-old AQHA bay roan gelding, consigned by John Wollenburg of Red Lodge, Montana and purchased by Ken Overcast of Havre, Montana for $8,000. Other high selling (tie) young horse was Lot 60 “Hookem Up Bartender” a 4 year-old AQHA red roan gelding consigned by Froelich Ranch of Selfridge, North Dakota and purchased by Nicole Norwood and Jason Fales of Cody, Wyoming for $8,000. This year there were also unstarted 2 year-olds offered for sale. The high seller was Lot 63 “Blue Light Jethro” an AQHA gray gelding consigned by Ashley QH’s of Forsyth, Montana and also purchased by Nicole Norwood and Jason Fales for $5,000. All four head of 2 year-olds averaged $3,815. With buyers from far and wide, the horses stayed close to home going to North Dakota, South Dakota, Colorado, Wyoming and Montana. Next year’s sale dates are April 15 and 16, 2016. The catalog is already full and the horses are hard at work on the ranch and in the hills. 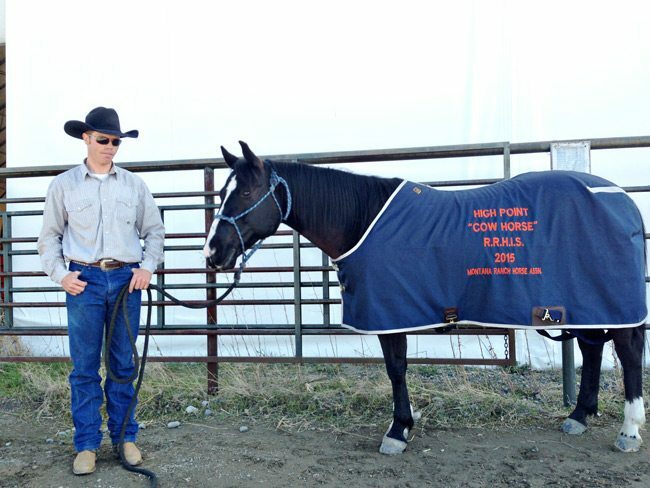 For more information, call 406-670-3400 or go to www.realranchhorses.com.